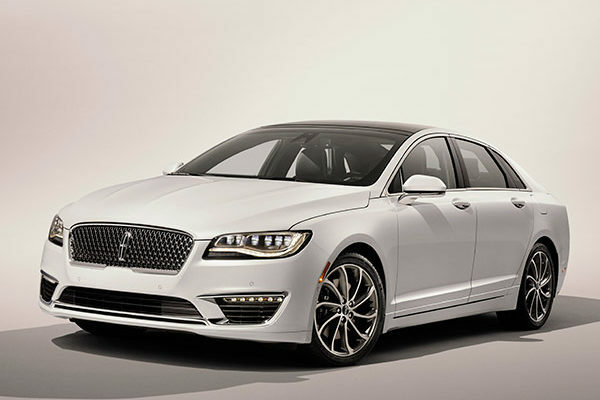 The Lincoln MKZ, built on the front-wheel-drive Ford Fusion platform, isn’t the flagship for the marque (that would be the larger Continental); instead, it is sporty, responsive, enthusiastic and entertaining. With its fastback profile it looks Jaguar-esque, and rivals include like Lexus ES envy the Lincoln’s lines. It’s been around since 2013; for 2017 it got a new nose and new engine, and for 2018 it gets four new colors. Base engine is a 2.0-liter turbocharged four-cylinder making 240 or 245 horsepower; it gets 24 combined miles per gallon with front-wheel drive, a bit less with available all-wheel drive. It comes with every model, meaning the more powerful V6 is an option in all of them. There’s also a front-wheel-drive Hybrid model (at the same price), a 2.0-liter four with two motors driven by a lithium-ion battery pack. It gets 40 miles per gallon combined, using a CVT transmission. The available V6 is a 3.0-liter twin-turbocharged EcoBoost making 400 horsepower and 400 pound-feet of torque with all-wheel drive, or 350 horsepower and 400 pound-feet with front-wheel drive. It’s mated to a six-speed automatic, and gets 20 miles per gallon with all-wheel drive. Available with this engine is a Driver’s Package that includes Dynamic Torque Vectoring to tighten cornering, and an active sport-tuned suspension. Also available is Lincoln Drive Control, with three modes to set the dampers, steering response, and stability control; it also has active noise cancellation to help build luxury silence in the cabin. An upscale version of Ford’s Sync 3 interface is used for infotainment and connectivity. MKZ models are the Premiere, Select, Reserve, and Black Label, with either the standard four-cylinder or available V6, and all-wheel drive available. Prices range from $35,445 for the front-wheel-drive Premiere to $49,720 for the all-wheel-drive Black Label. The Hybrid is only front-wheel drive, in the Premiere, Select and Reserve models, at the same prices as the base engine, which is uncommon if not unique. Available safety equipment includes inflating rear seatbelts, adaptive cruise control, lane-keep assist and collision warning with braking. There’s also parking assist, which takes control of the steering and parks the car for you. The nose is elegant and conservative, with a soft-edged trapezoidal grille bordered by thin LED headlamps wrapping inward. At the center of the mesh grille lies the Lincoln four-point star. The overall design emanates character, being daring while avoiding glitz and glamour. It’s smooth from the nose to the deck lid, not as sleek as an Audi A7 (nothing is that sleek), but still eye-catching. Although maybe not so much as in 2013. The cabin in the base Premiere model suggests a Spartan lifestyle, with fabric upholstery, plastic panels, and plastic knobs and switches that are satisfying to operate but no so much to look at. It also feels European, with a lot of real wood. And the top upholstery feels very luxurious, a supple leather sewn in diamond patterns. The optional panoramic sunroof opens a vast 15 square feet to the sky. With a pushbutton gear selector, there is no shift lever, so the console has more space for storage. The MKZ copies Volvo’s good idea with storage behind the console, but it’s harder to reach. The main screen dominates the instrument panel, mounted low and wrapped in metallic trim; it suits the cohesive arrangement of the gauges, and their glow. But the Sync 3 system can be maddening, so it’s a good thing there are redundant steering-wheel controls. There is also voice command, which doesn’t do much of what you command it to do. The front seats are slightly firm, narrow but not too narrow, and well bolstered. As sport seats they go pretty far, with cushions that inflate and deflate depending on the G-forces in the corner. Too far, we think, to distraction and annoyance. Goosed while driving. We wish we could have gotten seat time in the sleeker and less ambitious standard seats. The MKZ doesn’t offer expansive legroom like the Lexus ES, or even as much as many other rivals. Meanwhile the rakish roofline steals headroom; there’s less than the Fusion, which isn’t exactly ample itself. The trunk holds 15.4 cubic feet, a bit above average. The base 2.0-liter turbo four accelerates to 60 mph in a leisurely 7.5 seconds, dragging the MKZ’s weight of nearly two tons; its 270 pound-feet of torque and 6-speed automatic transmission are frequently challenged and fully used. During two-lane passing, throttle response is prompt, with nary a hint of turbo lag, so the acceleration is decent. However the engine can sound coarse at full throttle, overpowering the noise cancellation system that otherwise keeps noise down. The V6 works better with 400 horsepower than 350, not because of the power but because of its all-wheel drive with the optional Torque Vectoring. With front-wheel-drive and 350 horsepower, it can spin the inside front wheel when accelerating hard out of slow corners; in the wet, that might be an issue. But the 400-horsepower all-wheel-drive with torque vectoring prevented it, making the cornering, especially under acceleration, more secure. That same Driver’s Package that brought torque vectoring, also continuously controlled the damping, via the active suspension balances ride and handling. It has comfort, normal, and sport modes. The paddle-shifting 6-speed automatic transmission is sharp, but in manual mode it’s necessary to stay in a gear that keeps the revs up with the four-cylinder engine, or else acceleration fades. Some cars in this class have 7- or 8-speed transmissions, which help keep the revs up because with tighter gear spacing there’s less of a drop between shifts. The Hybrid mates its 2.0-liter four-cylinder engine to lithium-ion batteries and a continuously variable transmission to get its 40 miles per gallon. You can feel more differences, including lighter steering and slower response with the CVT than the automatic; but it’s smooth and quiet, and encourages satisfying efficient driving with smart and engaging displays. However the acceleration is tepid. Thanks partly to a rigid chassis, the MKZ handles well; it’s competent and sure-footed. It changes direction quickly, especially in Sport mode, with level cornering and good grip for a car this size with all-season tread on the tires. The electric power steering is nicely weighted but a little numb; it’s accurate and quick, from lock to lock just 2.7 turns. The ride is taut, firm but not harsh in the Sport mode, where we kept it most of the time; we found the other modes too soft. In Sport mode you feel only the big bumps. The Spartan cabin might be a dealbreaker; or you might like it. Not many like the Sync 3 infotainment interface. After that there’s much good news: ride and handling are excellent, the three powertrains all good in their own ways. The 400-horsepower all-wheel-drive V6 makes the MKZ a contender with the best sport sedans, while the Hybrid is slow but gets great fuel mileage for no extra cost.